Scott TechnologyScott Technology’s lamb processing robots. 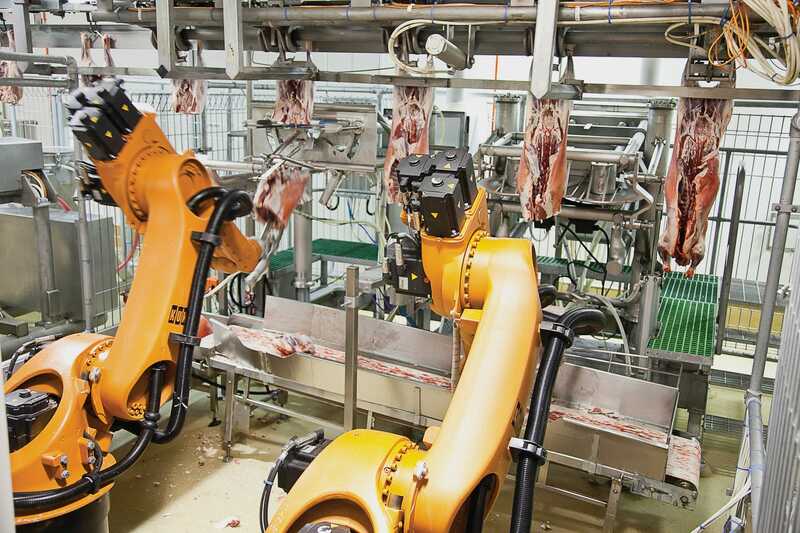 Australia’s meat processing industry is rapidly automating. Unions are concerned about workers’ jobs while the industry says its approach ensures better quality for consumers and a better deal for farmers. Meat workers are on the front line of industry automation so how it is being managed is a fascinating case study. This story looks at the technology, the funding, and the impact on workers, the industry, and consumers. Inevitably, this story contains video and photos of meat being butchered, by both people and robots. Workers across Australia are right to worry about a future where their current job could be replaced by a robot. According to a recent report by Adzuna, about a third of jobs are predicted to be replaced by robots within 12 years. The governor of the Reserve Bank of Australia even says this may be a factor in Australia’s low wages growth. Workers nervous about their futures may have reduced bargaining power, Lowe suggested in a speech less year, as they become less likely to ask for pay rises if they think they might be automated out of the workforce. But meat workers in particular are under siege right now. For starters, there are not as many sheep and cattle coming in to face the bandsaw, with a steady increase in the past 10 years of producers opting to sell their beasts as live exports. A couple of dry years across a lot of the country has also hampered herd rebuilding efforts. And perhaps most damaging is the simple fact meat from the US and Brazil is cheaper. Global demand for Australian beef, lamb and chicken is crumbling. And with that, barely a month goes by without stories of Australia’s 30,000 strong workforce of meat workers facing the wrong type of cut. Automation. The robots might be coming for all our jobs one day, but in abattoirs across the globe right now, they’re already a cold, efficient reality. In Australia, they’re the perfect test case for anyone wanting to get a sneak preview of what that fully-automated future will look like and why it is inevitable. There are also some major issues to deal with in regard to who’s paying for the technology, how the displaced human workers will be treated, and perhaps above all, our own behaviour as consumers. Just as we might choose to buy pole-and-line caught tuna or eat only certified organic foods, will we soon face the day where we consciously choose a leg of lamb processed by human workers? You just know that someone, somewhere is losing half a hand right now. US figures show the known injury rate for meat workers is the highest in all manufacturing. To keep that level of concentration safely up for eight hours a day, five days a week would be, well, inhuman. If ever there were a job that should be done by robots, it’s cutting up animals 24/7 to feed the humans. They can do it faster, more accurately, and more safely. Cheaper? Maybe. And that’s a pretty important maybe right now, because there are 30,000 jobs in Australia on the line, and allegations that the industry body set up to look after them is using the money those workers make for it to replace them with automated technology. Who’s paying for the meatbot army? According to its annual reports, Meat and Livestock Australia (MLA) is “primarily funded by transaction levies paid on livestock sales by producers”. That levy works out to around $5 for every cow and up to $1.50 for every sheep carcase bought, sold and processed in Australia. According to the Australasian Meat Industry Employees Union (AMIEU), those levies have raised nearly $1.3 billion since since 2003. The MLA reports revenue of $200.5 million in 2016-17, so it’s reasonable to trust the AMIEU on that $1.3 billion figure. Of that $1.3 billion, the MLA has set $526 million aside for research and development, and the Australian government has matched that funding dollar-for-dollar. So the AMIEU calculates that MLA’s research fund has pulled in more than $1 billion since 2003. The MLA also has an investment arm, MLA Donor Company, which is responsible for a lot of that research and development work. In May last year, it launched a $3.7 million, levy-funded 50-50 partnership with New Zealand company Scott Automation and Robotics. The research was focused on extending automated lamb processing methods to beef. Scott Automation and Robotics is the company that makes the robot butchers in the opening video you saw above. Scott Automation and Robotics is also 50.1% owned by one of Australia’s largest meat processors, JBS Australia, which in turn is a subsidiary of the world’s largest animal protein processing company. helping build better robot butchers, which results in a better bottom line for processors. If so, then you might now understand where AMIEU secretary Grant Courtney is coming from when he claims that Australia’s biggest meat processing companies are using the MLA as a proxy to take taxpayer funds and use them to “research technology which will slash their wage bills and boost their profits”. But before we get into it, it’s important to acknowledge the work the Weekly Times has put into covering this issue in the past year. It’s been a key resource for this story, as it always has been for a rural sector whose problems struggle to get widespread attention. And the fact that despite writing, fighting, protesting and legislating about it since the late 1500s, there are more Australians in work now than at any point in the nation’s history. They really are. At some stage, humans will come to terms with the fact that there should be much more to their lives than spending five of every seven days of it running chunks of meat through a bandsaw. Or sorting eggs, wrapping anything, writing match reports or playing drums in a rock band. It’s a tragic waste of the best brains life on this planet spent a couple of billion years developing. There are better jobs out there, and we probably won’t even find out what they are until we are prised away from menial labour and forced to look for them. In fact, for every “robots will take our jobs” study published, there’s a corresponding “robots will create even more jobs” study in train. But that’s not what’s driving the MLA under managing director Richard Norton. If it is, the AMIEU says it can’t find any evidence the MLA cares about what happens to the workers its research funding is helping to displace. The first big shift in the move to automation certainly looks like a win for the farmers, at least. Since June last year, Norton and the MLA have been out and about spreading the good word on something called “Objective Carcase Measurement (OCM)”. For hundreds of years, livestock farmers have handed their bodies over to the processor and been told that a human has valued its quality and they will be paid accordingly. The human grader is generally employed by the processor, so it’s no surprise that there’s historically been some friction at that point in the paddock-to-plate process. The MLA wants producers to shift to using technology known as DEXA (dual energy xray absorptiometry) to measure and grade a carcase. It’s what they call a “scientific approach” that takes the human trust element out of the equation, and it’s been trialled successfully. One livestock producer in South Australia claims DEXA had an 88% accuracy rate of predicting how much lean meat was in a carcase. He added that human “fat palpitation” methods could come in at less than 20% accurate. So DEXA could be good for producers (farmers), but potentially costly for processors – the properly big players in all of this. It’s not cheap to install, and to to get them on board, the MLA, and MLA Donor Company, offered to pay 75% of the cost of installing DEXA. The lobbying tour by Norton and co that followed was important, because as with all technology, the more data DEXA could access, the better it evolved to be a more accurate tool. In offering to fund the rollout, the MLA was telling all the stakeholders that it was the best way to ensure all the data would be shared for everyone’s use across the nation. And data accuracy would increase, so wins all round. The MLA boss was also out telling forums about how DEXA could save up to 20% of processing costs and pointing to a Greenleaf report commissioned by the Australian Meat Processor Corporation (AMPC) which found returns of up to $420 million a year were possible using DEXA technology. Four big processors jumped on board. With $10 million in co-funding from MLA Donor Company, and a matching $10 million in federal government funding, DEXA was installed at Gundagai Meat Processors, Frewstal, Wagstaff Cranbourne and Teys Australia. Teys gave the case study. It said it was facing a 20% reduction in shifts and a $10 million increase in energy bills over the next 12 months. Its business “had to evolve”. In May, Teys turned on DEXA tools at its Rockhampton plant just last month, saying it also sunk $2 million of its own money into it. And it’s at that point where – if you take the AMIEU’s standpoint – the momentum really started to shift against the human meat workers. DEXA is not a robot in the way you and I think about robots. It is, roughly speaking, a scanning technology, and the MLA and big processors are 100% within their rights to say it’s a beneficial technology for the meat industry. But DEXA also serves another crucial purpose. While the MLA takes the line that DEXA enables better objective carcase measurement, the meat workers’ unions says OCM is an excuse to roll out DEXA. And where DEXA goes, the robots will follow. More importantly, profit-making robots, because right now, robots actually aren’t a great investment, as Elon Musk knows all too well. Analysts at Bernstein and UBS claim a lot of the problems with the Tesla Model 3 production woes are due to the fact that “automation simply can’t deal with the complexity, inconsistencies, variation and ‘things gone wrong’ that humans can”. Even Scott Technology’s CEO, Chris Hopkins, in 2016, admitted to Business Insider that the cost for upkeep of the bots can often be more expensive than employing human workers. DEXA, as noted earlier, collects the data. Some of the data. Even two years ago when we talked to Scott Technology, just one worker was needed to oversee a dozen robots stripping 600 lamb carcases per hour. An MLA report claimed that lamb boning automation was returning $5 per carcase; or $3000 per hour in the example above. 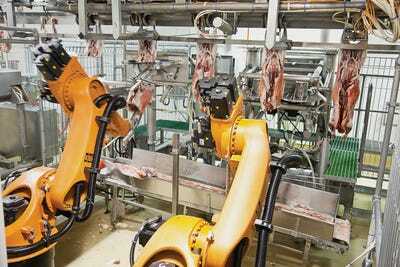 The technology for beef boning robots has been slower to develop, because the carcases are bigger and heavier, and muscle groups are more complicated than those in lambs. That’s important, because it’s one of the points where the MLA and the AMIEU think very differently about why scanning technology is creeping into meat processing rooms across Australia. But when Scott’s robots, scanning technology and AI all come together, a beef boning robot is expected to return an extra $15 per carcase. Hopkins told Business Insider that the company’s goal was to have robots in plants for beef and pork “worldwide”. “But we’re only going to get to that point if we can continue to improve the safety and the yield — and do it with a lot less people,” he said. It’s the MLA’s job to help the industry stay viable, and that means being competitive with cheaper workforces worldwide. And an Ernst & Young report supports independent studies that claim “significant benefits” for both producers and processors in using DEXA technology. The AMIEU says the third group of major players seem to have been overlooked. It wants to know how much of that more than $1 billion raised in research funding has gone toward developing programs that could help workers in the future who have been replaced with robots. So we asked the MLA, and they said well, not much at all. “We are more than happy to work with industry to go through change management practices, but I don’t see an industry that’s fully automated,” MLA’s General Manager of Research, Development & Innovation, Sean Starling, told us. In fact, Starling says whenever he visits a meat processing plant, he always asks the manager what their top five problems are. “Staff is always in that top five; they just can’t get enough,” he says, adding that it’s because the industry generally operates with 5-10% of its workers absent every day. And somewhere in the middle of that 5-10% is about how many workers the MLA estimates automated boning machines have replaced. The jobs, Starling says, are still there. At the moment, it’s all square between the robots and workers. This is the bit where we talk about robots making our lives better. Despite forking out several million dollars to install DEXA scanners, processors still aren’t getting the technology they need if they actually do want to run their human workforces out of town. DEXA is a 2D tool. It’s simply not good enough to guide a robot arm around the intricacies of a full side of beef. It works for lamb, because all lamb processors essentially cut a lamb up the same way. Beef, Starling says, can be approached from roughly four different directions. And only when the MLA can convince all beef processors to adopt the same single approach will DEXA actually start to hit its straps. For now, DEXA’s value-add is has come from letting a processor know how much meat, fat and bone is on a carcase. That in turn lets them do two things: give that producer some feedback about how that animal performs, and hopefully be rewarded on it; and allows the producer to group carcasses into more accurate bone-out runs. “So if you’ve got a certain customer that wants a certain fat percentage on a T-bone steak, then using DEXA you can say of the 1000 carcases I’ve got today, those 100 are best suited for that customer, rather than bring out the first 100 and hope that they hit market specs without excessive trimming,” Starling says. We asked Starling what he thought of the AMIEU’s claims that robots will help processors “slash wage bills” and he gave us his best estimate of how many humans DEXA and lamb-boning automation has actually replaced. “Think about real estate. If you look at an aerial footprint of a lamb boning room, one-fifth of the real estate would be automated,” he says. “If you looked at labour units, it might be six labour units in a 100 to do a standard bone-out. But, Starling adds, “you keep them in that boning room because the absenteeism would be more than six every day anyway”. And it’s not just missing employees the MLA has to worry about. MLA’s R&D boss tells us of a case within the last 12 months when an operator at an Australia processing plant was using a handheld powered circular saw, and slipped. “That saw went through their face, their shoulder and down into their torso,” Starling says. “That individual survived – I don’t know what long-term injuries they’ve got – but we have got a solution that’s now available that means no one ever has to do that task again. The powered tools we use do not say ‘Sorry I missed’. Yes, other technologies have completely removed operators from tasks – but they were extremely dangerous tasks. Starling says they’d rather see workers in the kind of boning room where they have a knife in their hand rather than a machine. “The powered tools that we use do not say ‘Sorry I missed’. They take pieces of human body off, and I can’t stand by if I have the power to do it, and not invest in trying to get people away from those tasks,” Starling says. Any job losses to date, Starling says, have come from plant closures. It’s a volatile industry and there’s no better place to get up to speed with the current situation than this extremely in-depth Chronological History of Australian abattoirs and meatworks. If Top End cattle producer Jo Bloomfield ever has to shut her doors, she has a very promising future in data collection. So does the union – and more importantly, the workers it represents – have a valid concern? According to the line the MLA is currently taking, not yet. Starling does, however, leave the door open just enough for those who care enough about their jobs to understand that if a robot can do it better, that job’s days are numbered. When it comes to beef, DEXA will only become properly efficient if processors can agree on a single approach to boning. “That’s a process we’re taking the industry through now,” Starling says. For more complicated processes, a three-dimensional CT scan is required. “We’re currently investing in three-dimensional scanners,” Starling freely admits. “We’re hoping … they’ll help us get a measure on the health of that animal. Our industry is underpinned by ensuring that we’ve got animals that are fit for human consumption. “The second thing is it may be able to give us a more objective measure, a more accurate measure, on eating quality. “They’re four we’re in discussions with, but we’re happy to work with anybody,” Starling says. It’s not just the meat industry. The workforces on the planet in which some aspect of production isn’t in some way under threat are becoming scarcer by the day. For now, here’s all the comfort we can offer anyone whose job might be replaced by a robot. Which, remember, could be a third of Australian jobs by 2030. For one, you’ll often hear someone say “But somebody has to make the robots”. You can dismiss that instantly, because of course, robots will make the robots. And AI will develop the technology that leads to robots making the robots. Interesting, Microsoft now prefers to call AI “augmented technology”, because in the past 12 months or so, there’s been a significant shift in how technology companies and their PR associates have dealt with their increasing use of AI and automation. There’s a very deliberate push on right now – out of Silicon Valley and a long way from Australia’s abbatoirs – to fend off concerns about how robots might take all our jobs by sticking to a new line of what kind of jobs automation will create. The preferred outcome we’re all supposed to be considering now is that with menial tasks taken off our hands, humans can now concentrate on making the world a better place. Apparently, a new Renaissance is coming in which the most valuable employees will be thinkers and artists. So here’s a radical idea – if humans have had to put $5 from every carcase toward automated technology and giving (some) jobs to robots, maybe every $5 for carcases processed entirely by robots could go towards training former abbatoir workers to become thinkers and artists? The MLA has several valid justifications for using part of a levy on producers to fund a multimillion dollar research project with a company that makes robots to replace human workers and increase profits for processors. A robotics company, let’s not forget, that is majority owned by the world’s largest meat processor. The CEO of the Australian Beef Association, David Byard, says it’s near impossible to find out where those levies are being spent. “The operation of the MLA Donor Company (MDC) is integrated into MLA annual report and the secrecy surrounding the outcomes make it almost impossible to find out who gets what,” he’s quoted as saying in an AMIEU release. But there’s also another reality to consider. There’s a trend towards humans – particularly young, privileged ones – not really wanting menial, labour-intensive careers. Ask any farmer trying to hire a team of pickers right now. The agriculture and mining industries in particular see robots as the only long-term solution to their future viability. Tasks aside, more and more people simply don’t want to live in the regional areas that host our farms and processing plants. Any savings made through the development of automation technology should be used to fund skilling and training programs for affected workers so that they can continue to contribute to the economy. For the processors at least, the answer is much simpler. “The good thing about robots of course is they don’t have days off, they don’t get sick, they don’t have absenteeism,” Teys’ general manager of corporate affairs Tom Maguire told Queensland Country Life at a recent open day to demonstrate the DEXA-to-robot production line.